den Februar 28, 2016, 10:26 a.m. Ahead of Super Tuesday, both Hillary Clinton and Donald Trump hold wide leads in Georgia and Virginia, according to the latest wave of the YouGov/CBS News 2016 Battleground Tracker. 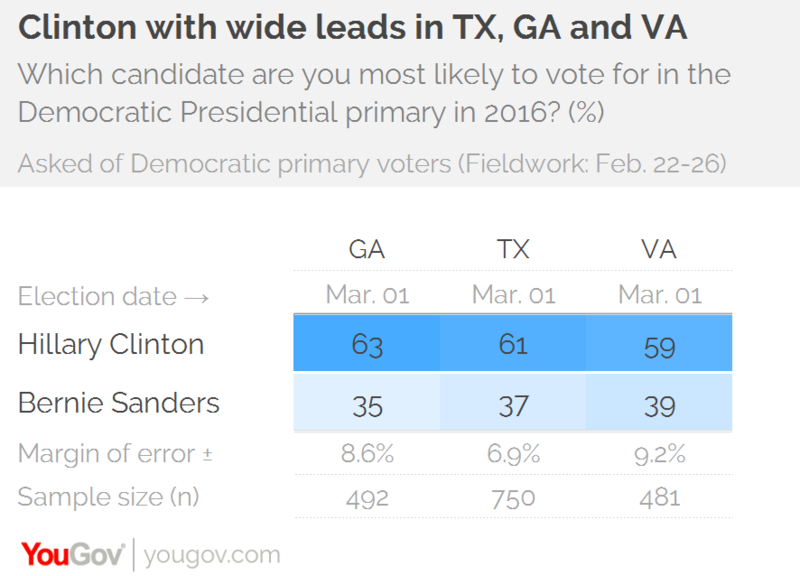 Clinton also tops rival Bernie Sanders in Texas, where Trump is more than 10 points behind Ted Cruz. Donald Trump, coming out of three consecutive primary and caucus wins, holds leads of 13 points in Virginia and 11 points in Georgia among likely Republican voters. Florida senator Marco Rubio and Cruz alternate second and third place in these states, with Rubio taking 27% in Virginia to Cruz’s 22%, and Cruz taking 29% in Georgia to Rubio’s 22%. 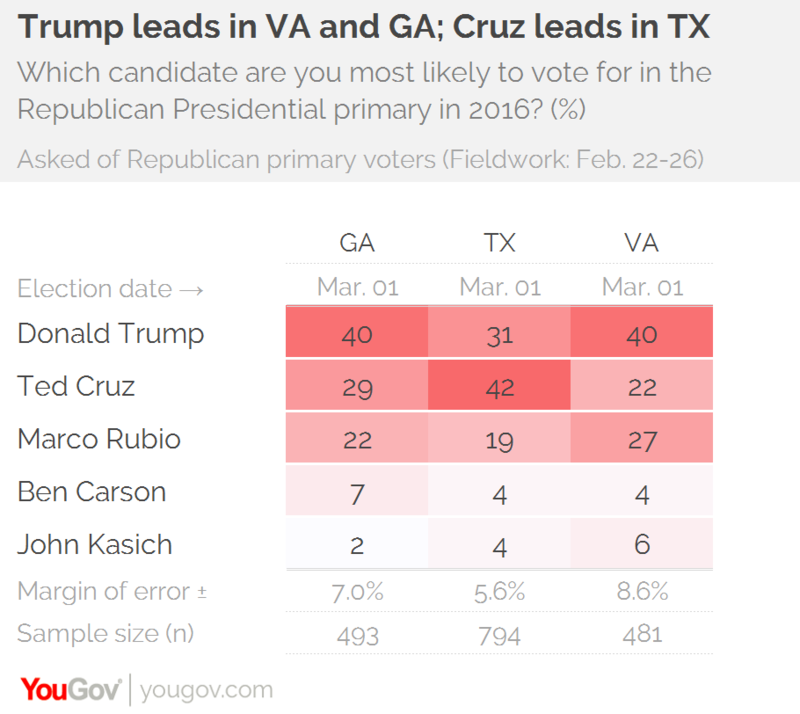 In Texas, Cruz's home state, he leads Trump by an 11-point margin, 42% to 31%. 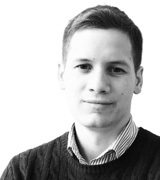 Marco Rubio comes third with 19% support. Republican voters in these three Southern states give the vast majority of their support to Trump, Rubio or Cruz – neither retired neurosurgeon Ben Carson or Ohio governor John Kasich make it out of single digits in any of the states polled. The surveys were conducted February 22-26, overlapping with both the Nevada caucus (February 23) and the latest Republican debate (February 25). Looking back to YouGov’s last poll of Texas and Georgia in mid-January, the race doesn’t seem to have changed too much at the top. Cruz’s lead over Trump has narrowed from 15 points to 11 points in Texas, and Trump’s 10 point lead over Cruz in Georgia has hardly moved. However, more than half of the field has dropped out since the last poll, which was conducted before the Iowa caucus on February 1. The biggest beneficiary appears to be Rubio, who is up 9 points in Georgia and up 11 points in Texas. The demographic and ideological breakdown in supports similar patterns to what has been seen in the recent Nevada caucus and South Carolina primary. 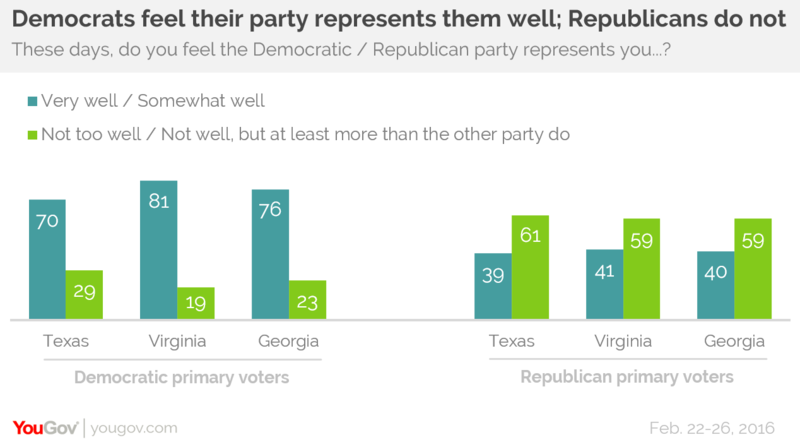 In Georgia, for example, Cruz leads Trump among “very conservative” voters by 10 points, but trails both Trump (by 22 points) and Rubio (by 5) among other conservatives. Evangelicals, who make up a majority of Georgia's Republican electorate and have been a major target group for the Cruz campaign, opt for Trump over Cruz by 39% to 34%. There are also warning signs of future volatility. Only 40% of likely voters in Virginia have very strong support for their preferred candidate. The number is higher in Georgia (46%) and Texas (52%), but around one in five voters in every state say they might still change their minds. In the Democratic race, there is a clearer picture. Hillary Clinton leads her lone rival Bernie Sanders among likely Democratic voters by 20 points in Virginia, 24 points in Texas and 28 points in Georgia. Across the board Clinton’s leads are powered by big advantages among non-white voters, who make up a large share of the electorate in many of the Super Tuesday states. She and Sanders are essentially tied among white voters in each state polled for the Battleground Tracker. But Clinton wins black Democrats by 54 points in Texas, 52 points in Georgia and 49 points in Virginia. 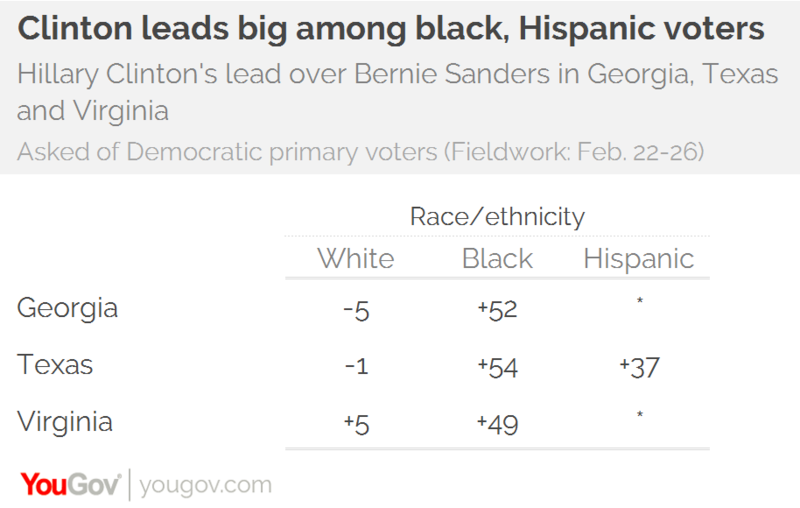 In Texas, the only state polled with a large Hispanic population, she leads with the group by 37 points, 68% to 31%. The poll also finds that voters on either side of the political spectrum have dramatically different feelings about how well their own party represents their interests. On the Democratic side, the vast majority of voters say the Democratic party represents them at least somewhat well, if not very well. The opposite is true among Republicans: in every state polled around six in ten voters say the G.O.P does not represent them well. This would appear to explain – or reflect – some of the anti-establishment mood that has defined the Republican race but appears to have failed to catch fire among Democrats, at least in the South. In fact, asked directly whether “establishment” support would make them more or less likely to vote for a candidate, Republicans are far more likely to say “less likely” than "more likely", by 49% to 11% in Virginia, 48% to 5% in Texas and 48% to 4% in Georgia. The YouGov/CBS News 2016 Battleground Tracker is based on surveys of registered voters who had previously voted in primaries in Texas, Georgia and Florida. The poll was conducted online but included registered voters who were contacted by phone. See a more detailed description of the methodology used here.